Performance of traditional Ossetian 'khonga' may be a record-setter. A dance ensemble hopes to have their performance on Europe’s tallest peak certified by the Guinness Book of World Records. 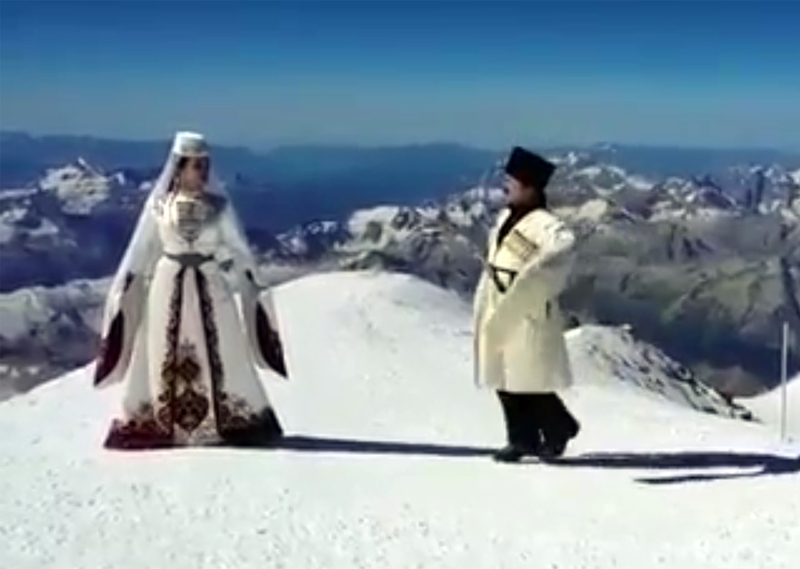 A Russian dance ensemble is preparing to submit an application to the Guinness Book of World Record for highest-altitude dance performance after group members ascended Mount Elbrus and performed the traditional Ossetian dance, the khonga, on its summit, the Eto Kavkaz website reported. According to the head of the Alania dance ensemble, which performed the action, the group spent several months planning and preparing for the event. In addition to working on the choreography, the team had to consider other issues, such as the best clothes for the dancers to wear and how to capture the dance on video. The dancers also had to train for the climb. Instructors worked with them for eight months to prepare for the ascent. Dates and the traditional Caucasus sweet Churchkhela, which is made from grape juice and walnuts, were an important part of the climbers’ diet, as they are believed to saturate the body with oxygen. The expedition was led by Rafael Ramazanov, a world-class mountaineer from North Ossetia who set the absolute speed climbing record on Mount Elbrus last year — he conquered the summit during the Supermoon eclipse in just three-and-a-half hours. Ramazanov said that preparing the dancers for the climb was particularly difficult because beginners cannot stay at the summit longer than 15 minutes due to the lack of oxygen, and during that time they had to set up and perform the dance. Mount Elbrus, located in the Republic of Kabardino-Balkaria near the Russian border with Georgia, is the highest mountain peak in Europe. It rises 18,510 feet above sea level.